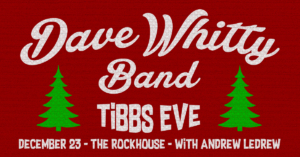 Come start your holiday season with the Dave Whitty Band on Tibb’s Eve. The band will be playing songs from all of Dave’s albums as well as a number of holiday and christmas favourites. Opening set by Andrew Ledrew. $4.75 Miller Lite and SOL all night.